If you think you meet all of these criteria, you should talk to your primary care provider about being screened once a year for up to three years in a row. We do not recommend being screened for lung cancer with a chest x-ray. 1. What is low-dose CT and why should I be screened with it? Low-dose CT is a very detailed scan of your lungs and it can pick up much more than a chest x-ray can. By being screened with low-dose CT, you are more likely to detect lung cancer when the disease is at an early stage, which can make treatment more successful. 2. Why should I not be screened with chest x-ray? There is no demonstrated benefit of screening for lung cancer with chest x-ray (e.g., better survival after treament), an abnormal chest x-ray test result could lead to harms from an invasive follow-up test. 3. Why should I be screened only once a year for 3 years? Currently, we have evidence only on the benefits and harms of annual screening for three years in a row. 4. What happens if I receive a positive low-dose CT scan result? 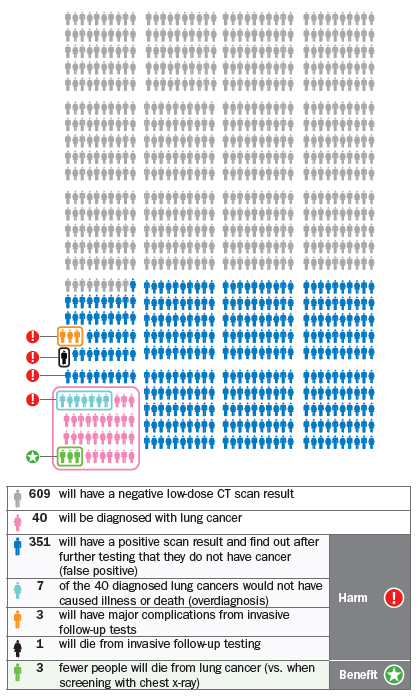 Most people who receive a positive low-dose CT scan result do not really have lung cancer (these are called false positives). Being screened is an individual preference. Because of the small chance of benefit, and the risk of possible harms, you should discuss your decision with your primary care provider.